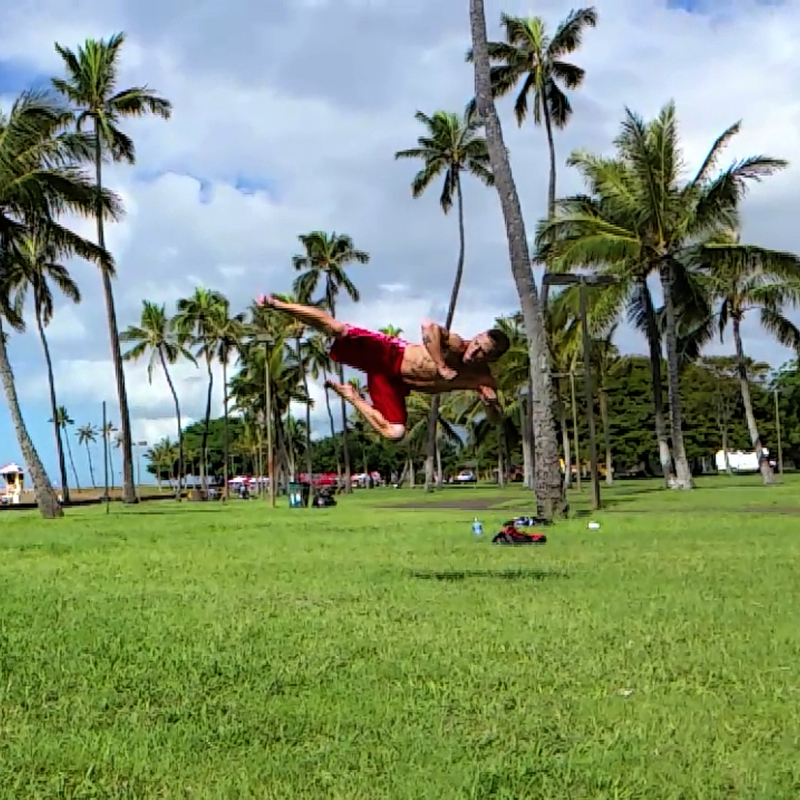 Ninja Training Hawaii | Obstacles, Strength, Movement and Fun! All Ages! Short Explanation: This program prepares students for participation in Hawaii’s version of America Ninja Warrior (Championships), as seen on television. Our Definition of NINJA: The ability to effectively and efficiently move through an environment (often an obstacle course), or on apparatus, smoothly and stealthily while displaying exceptional technique in a way that appears effortless and unnoticeable (covert/stealth/silent). Thus, we use Ninja to refer the way gymnastics skills are performed with no reference to combat or martial arts. Since 2002, Hawaii Academy has conducted ‘Mixed Gymnastics‘ classes, providing a sampling of most gymnastics disciplines (women’s artistic, men’s artistic, trampoline and tumbling, acrobatic, rhythmic, group, and fitness gymnastics). However, starting in 2016 these mixed gymnastics classes have been renamed Beginner, Intermediate, and Advanced (Gymnastics) Classes with the emphasis shifted from traditional artistic gymnastics disciplines and events (e.g., vault, bars, beam, floor) to more practical (everyday) skills and obstacles/apparatus. Furthermore, much of the previous apparatus and fitness training was moved into two new program called ‘Ninja Zone‘ (for students age 3-11 years) and ‘Gymnastics for NINJA‘ (for students age 12-100+ years) with a major emphasis on functional abilities needed for efficient, effective, fluid, and stealthy movements through obstacle courses that require skills obtained from gymnastics and fitness training. Curricula for Ninja Zone students at HA strictly follows franchise requirements of Ninja Sport International® and Ninja Games® with training that prepares students for our annual Hawaii Ninja Games. Curricula for Gymnastics for NINJA classes was created by HA for students 12-100+ years of all abilities (remedial to world class gymnasts) with an emphasis on lifetime fitness, gymnastics, human sciences, life lessons, and preparation for performing in our annual Hawaii Ninja Warrior Championships. The curriculum for this program is divided into 10 units, each containing skills addressed according student ability levels. Following is an elaboration. Greeting and Lesson Objectives. Each class begins with communication of an overview of the lesson and objectives. Limitation Screening and Improvement Monitoring. After detection of a limitation or susceptibility, instructors monitor student progress in personal training to improve their status. Most important is injury prevention by identifying unusual joint range of motion issues (e.g., hyper-extensions or hypo-extensions) in elbows, knees, wrists, and hips. The goal here is to inspire students to train at home and to show their instructor the improvements they have made. Safety Training. This unit addresses safety rules, environmental design for injury prevention, use of a preflight checklist, and the necessary maneuvers of falling (crashing) without injury. Fitness and Performance Training. Fitness is generally defined as the ability to do what one wants. Essential for fitness is capabilities in six areas: Strength, Flexibility, Endurance, Speed, Balance, and Agility. Acrobatic Tumbling Training. This portion of training involves the systematic acquisition of motor skills according to progressions (in skill difficulty), often by doing drills to correct components. These skills are generally organized in six categories: Rolling, Cartwheeling, Springing, Flipping, Aerials (Tricking), and Vaulting. Apparatus Skills Training. This unit covers essential skills for climbing (pegboard, cargo net, rock wall, rope, silk), traversing (horizontal ladder, horizontal rings, horizontal rope), floor, balance beam, vaulting, mushrooms, still rings, etc. Academic Instruction. Each class contains human sciences academic instruction according to age, maturity, and ability levels. Topics addressed include: human anatomy, exercise physiology, biomechanics, skill learning, and teaching methods. Also included in this unit is sections on strategies for success and important life lessons. Obstacle Course Training. Because classes prepare students for fitness and obstacle course competitions it is important to prioritize training for acquiring skills to complete these courses and actually training on such courses. Competition Training. The ability to perform on demand and to do so at levels better than one’s cohorts requires more than just skills training and experience with competition. This unit identifies very specific performance strategies (rules of conduct) that help get higher competitive rankings at such challenges. Burnout and Bowout. Finally, each class ends with at least five minutes of exhausting exercises and the Academy closeout ritual that demonstrates discipline (lineup, perfect ending posture with arms overhead), respect (bow), appreciation (thank you to instructor and classmates in Japanese or specified language), and closure (applause). Vaulting Blocks, Foam Platforms/Pedestals, Floor and Wall Bars, Balance Beam, Still Rings, Rope Climb, Low Climbing Wall, Horizontal Ladder, Peg Board, Launchers (e.g., single and double mini-trampolines, spring boards, air/spring/rod floors), arranged into Obstacle Courses. This program is NOT parkour, free running, urban gymnastics, tricking, stunting, or a martial art. It is NOT designed to be recreational, unsupervised, or in any way contain freeplay or horseplay. It is not combative, violent, or used for personal defense. Instead, the Gymnastics For NINJA Program IS a highly structured and disciplined physical education program with detailed curricula for three ability levels (Beg, Int, Adv) with instructional units (each containing required skills that are acquired sequentially through mastery of progressively more difficult elements/maneuvers), behavioral objectives, and advancement criteria defined by skill and content attainment. All instruction is provided by highly qualified (HA certified) instructors on the safest and highest quality equipment available and is overseen and evaluated by the program head and administrators from HA research and other departments. We emphasize non-violence, skilled (safe) falling, discipline and respect, wellness orientation, exercise and sport sciences, human engineering, educational psychology, random acts of kindness, and life lessons (particularly developing passion for pursuits, happiness, independence, resourcefulness, and being successful by employing strategic planning with GPSb: Goal-Plan-Schedule-Budget). Primary Objective: To better one’s annual ranking in the Hawaii Ninja Warrior Championships by training to improve health, physical fitness, essential skills/abilities, performance under stress, and ultimately personal wellness. Beginner classes are for all ages (from 12-100+ years) and focus heavily on fundamental gymnastics skills like kipping, swinging, vaulting, flipping, twisting, running, diving, and apparatus maneuvers as well as essential fitness training. Students develop air awareness (kinesthesis) and safe falling techniques before learning more advanced maneuvers. Intermediate classes begin to implement transitions and combinations while strengthening the basics. Learning to balance weight on one foot or one hand is introduced as well as an essentials of biomechanics. Training circuits are used for skill and fitness development to complete obstacle courses and routines. Advanced classes are only for individuals who have demonstrated exemplary control of skills and advanced performances in previous classes/levels/competitions. At Hawaii Academy we strive for the safest training conditions possible. This requires an abundance of soft mats/cushions and specialized landing surfaces, exceptionally qualified instructors, and lesson plans with behavioral objectives and skill progressions. We train students to apply their skill sets to not only traditional gymnastics events/apparatus but also to everyday settings, as the sport of gymnastics and gymnastics physical education units were originally intended. We avoid combative elements and physical contact between participants. Extra Practice: We provide structured and disciplined classes of formal instruction with no free play or dangerous horse play. In addition to our highly structured classes, we provide time on First Fridays (8-10p at the Honolulu Gym) and Second Saturdays (5-8p at the Pearl Harbor Gym; military base access required) evenings for extra practice on skills learned in class, personal development/training, and practice with friends not yet taking classes (see HA schedules inquire at the office for Fun Night information). Check us out for Ninja Training Hawaii.